the nation's No. 1 Micropolitan Area for corporate projects. Richard Childress Racing is expanding both its corporate headquarters and manufacturing plant in Welcome, N.C.
or Richard Childress Racing, winning the Daytona 500 happens not just at a Florida speedway on Sunday. It occurs Monday through Friday as race teams research, develop and produce the technological advancements needed to give their drivers the winning edge. The fact that RCR engineers and technicians do most of that work at an industrial facility in the small North Carolina town of Welcome is no accident. Just like the meticulous strategy that RCR employs to enter Victory Lane, economic developers in Davidson County use innovative methods to win corporate expansion projects. the Thomasville-Lexington micro area beat out every other small town in the nation to claim the checkered flag. Davidson County, home base of this micro area just an hour north of Charlotte, is also home to Welcome, the little city that's home to one of NASCAR's biggest and most successful race teams: RCR. In 2007, RCR announced two significant projects in the area: an $8-million expansion of its corporate headquarters and Sprint Cup shop, adding 55 employees and 93,000 sq. ft. (8,640 sq. m.), and a $1-million expansion of its manufacturing plant, adding 20 workers and 25,000 sq. ft. (2,323 sq. m.). Based in Welcome since 1986, RCR now occupies 500,000 sq. ft. (46,450 sq. m.) of shop space on site. "This is basically where Richard Childress was born and raised, just outside the Winston-Salem area," RCR spokesman David Hart says. "He just wants to give back to the local community." Being located in a county of just 157,000 people makes sense for many reasons, Hart notes. "People want to be here and they make an effort to be here. Rolling your tool chest from one race shop to another just doesn't happen here," he says. "Being pretty much the only major race team in town helps our security and guards our trade secrets. You are not going to the same places for lunch as the other race teams." The expansion is designed to consolidate what were once 15 separate buildings on site and to make room for the addition of a fourth racing team in 2009. RCR currently fields three teams in NASCAR's premier division, the Sprint Cup series: the crews of drivers Kevin Harvick, Clint Bowyer and Jeff Burton. RCR also fields three race teams in the NASCAR Nationwide Series. Harvick, the 2007 Daytona 500 champion, anchors a team that has earned more than 150 victories and 10 NASCAR championships, including six in the former NEXTEL Cup series with the late Dale Earnhardt Sr.
Hart says the growth is aimed at putting more RCR drivers in the winner's circle. Since 1999, the firm has either built a new building or renovated an existing facility in all but one year. The company recently purchased additional land, increasing its footprint from 35 to 50 acres (20 hectares), to allow room for more expansions. While RCR is the racing team juggernaut in the Thomasville-Lexington market, Hart says the motorsports industry is growing rapidly throughout the county. "Rohrig, which makes shocks and suspensions, just moved here, and JKS Motorsports just moved to Lexington from Winston-Salem," he says. Located just 45 minutes from the famed Lowe's Motor Speedway in Concord, RCR is always only a short drive away from one of the best "test tracks" in the business. Motorsports, ironically, is a big reason why Thomasville-Lexington unseated North Carolina's Statesville-Mooresville from the top spot of the micropolitan rankings this past year. Just a little over an hour away, the Iredell County micro known as Race City USA had won the Site Selection ranking for three consecutive years. 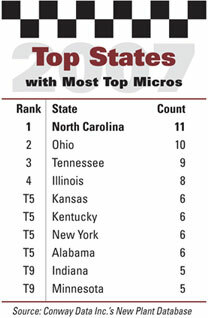 In 2007, Statesville-Mooresville placed second, albeit with a still-strong showing of 21 corporate facility projects. Steve Googe, executive director of the Davidson County Economic Development Commission, says success in recruiting racing technology companies has led local officials to make a bold play for an even bigger prize in the world of cars and trucks. "We are diligently working to create a mega-site that we would like to market to an automotive assembly facility," Googe tells Site Selection. "We want in five years to have an automotive plant here in our area, as well as the groups of suppliers that come with such an operation. Along with focusing on our core strengths, including advanced manufacturing and wood products, we think that automotive, metal fabrication and electronic assembly will grow here." For nearly a century, Thomasville and Lexington built their names by making and selling furniture to the world. The two cities still do a lot of that, but Googe says industrial diversification is well under way. ack Schultz, author of Boomtown USA, on the Thomasville-Lexington Micropolitan Area: "The message coming out of both this community and Statesville-Mooresville is that both succeeded in the long run because they developed a strong manufacturing base. Companies feel comfortable going there because of the strong work ethic. But communities have to continually reinvent themselves. You can't rest on your laurels … You always have to proceed as though you are on the bottom of the heap." ara Haire Tice, chair of the Mooresville-South Iredell (N.C.) Economic Development Corp., the organization representing the No. 2 micropolitan area for 2007: "Our quality of life seems to be our No. 1 benefit that we enjoy here. We have one of the lowest ad valorem tax rates in North Carolina. We strive to provide the best benefits at the lowest cost, and that is pleasing to our larger companies." od Crider, president of the Wayne County (Ohio) Economic Development Council, the organization representing the No. 3 micropolitan area for 2007: "It sounds almost like a cliché, but there is a level of cooperation that exists here that I haven't seen in other areas. That has a lot to do with businesses feeling comfortable in locating here. The second part is that companies really value the work force here. We are not so far removed from our agricultural heritage. The work force expects to give a hard day's work for a day's pay." "You have to look at history to determine where your future is," he says. "We were very reliant on major manufacturers that would employ 4,000 to 8,000 people in our county. Our community rode the back of the furniture industry for 80 years, and when that changed, it was quite a shock." From 2000 to the end of 2006, the community lost about 7,500 jobs, most in the textile and furniture sectors. But out of loss came opportunity. "Duke Energy and Norfolk Southern assisted us with time and personnel and money. Initially, we worked with a lot of very small companies to relocate them to 10 million sq. ft. (929,000 sq. m.) of old textile and furniture plants that had been sold to developers," Googe says. "Today, companies are moving into these spaces and leasing them at rates under $3 per square foot. We have been able to occupy these buildings with distribution facilities, small manufacturers and incubators. Small businesses can get a very reasonable rate here. Plus, people are looking for skilled labor that's unemployed." The result was a huge payoff in 2007, as 30 large corporate industrial projects were announced countywide. The largest capital investment came from Unilin Flooring, which announced a $30-million factory expansion in Thomasville. The biggest employment generator was U.S. Xpress Inc., which is creating 700 jobs in trucking and logistics at a new distribution center in Lexington. The projects aren't coming just from American firms. "We have seen a tremendous amount of European and Asian companies coming to this area," says Googe. "Arneg, an Italian refrigeration company, is building a $20-million plant and bringing 181 jobs to the county." And what does Googe plan for 2008? "We have had a tremendous number of prospect visits and inquiries already this year," he notes. "Those projects typically take from 12 to 24 months to come to fruition. So for us, the real success will probably come in 2009 and 2010." In other words, around the time that Richard Childress fields yet another team capable of winning the Daytona 500, look for the Thomasville-Lexington area to make another run at victory lane for small towns. Site Selection Online – The magazine of Corporate Real Estate Strategy and Area Economic Development. ©2008 Conway Data, Inc. All rights reserved. SiteNet data is from many sources and not warranted to be accurate or current.